How can we be sure our next year will be better than the last? We can’t – not really. But we can be sure that we can make it through if we stay focused. Proverbs 4:25-27 (NIV) tells us, “Let your eyes look straight ahead; fix your gaze directly before you. Give careful thought to the paths for your feet and be steadfast in all your ways. Do not turn to the right or the left; keep your foot from evil.” To go one step further, we need to be looking to God. Only He has the power to save us. 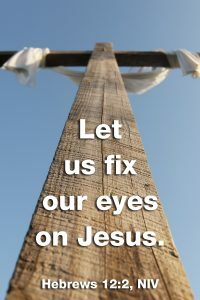 (Isaiah 45:22) We need to keep our eyes fixed on Jesus. (Hebrews 12:2) We lose power, hope, and purpose when we don’t focus on the right things. Jehoshaphat’s kingdom of Judah was being threatened by the armies of many nations like Ammon and Moab who joined together to annihilate Judah. These huge armies were strong and surrounded Judah. There seemed to be no chance of survival. So people from every town came together to seek help from the Lord. God told the people not to be afraid or discouraged. He told them to face the enemy and stand firm. They would not have to fight this battle because it was the Lord’s. The people fell down in worship to God. Early the next morning, Jehoshaphat encouraged the people to have faith in the Lord. As they headed off to battle, he appointed men to lead the way by singing and praising God. “Give thanks to the Lord. His love endures forever.” As they sang, a miraculous thing happened. These armies began to attack one another instead of Judah. By the time Judah got to the battleground, they saw only the dead bodies of their enemies. With Jesus in our lives, we are never alone or forsaken. 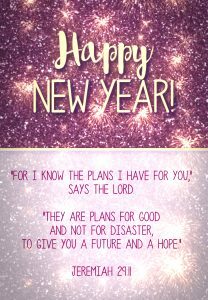 (Hebrews 13:5-6) I don’t know what this next year will hold for us, but I do know we can face anything if we keep our eyes on Jesus. One final thought… May all your troubles last as long as your New Year’s resolutions!